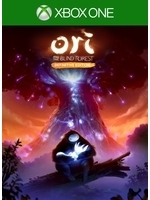 Nordic Games has parterned up with Microsoft Studios and Moon Studios to bring the Steam version of Ori and the Blind Forest: Definitive Edition to retail on June 14. The standard edition costs $19.99 while the limited edition is priced at $29.99. One of the best games, I´ve played for sure. Everytime I watch the intro I get emotional... I love this game. The art, gfx & music are majestic af, a true gem of the genre. i hear the xbox version won't see a physical release outside of US? at least that was the case when the news broke on neogaf. surely that's not true, right?